Apple CEO Tim Cook has been named as one of eight new board of trustee members at his alma mater Duke University, where he earned his MBA from the Fuqua School of Business in 1988, the school announced today. Cook began serving his six-year term on July 1 and will assist the governing body in determining Duke University's educational mission and fiscal policies. The other new trustees are The Coca-Cola Foundation chairwoman Lisa Borders, PRM Advisors founder Patricia Morton, NBA commissioner Adam Silver and ValueAct Capital CEO Jeff Ubben. Duke University also appointed three observing members on the board, including Elastic Fabrics of America marketing executive and Duke alum Jack Boyd, recent Duke graduate Anna Knight and Duke JD/MBA candidate Ben Shellhorn. 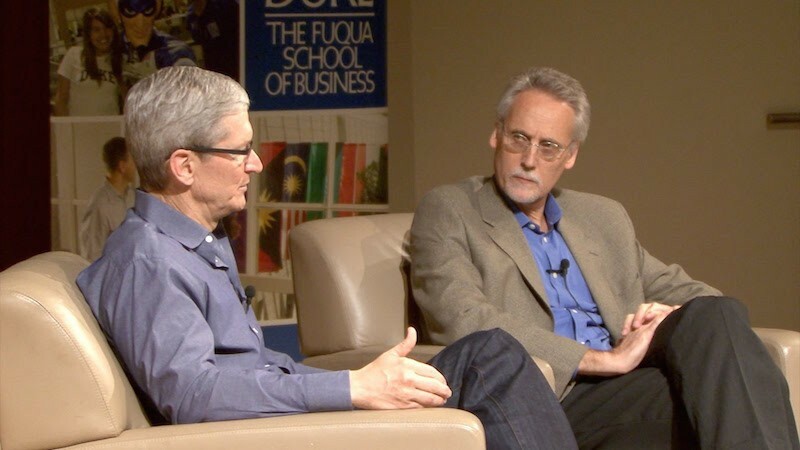 Cook returned to Duke University in 2013 for his 25th reunion and participated in an hour-long dialogue with Fuqua School of Business Dean Bill Boulding and students about why Apple is successful, collaboration, ethical leadership, career planning, inspirational leaders, intuitions and more. The embedded playlist of videos above will play through each of the seven clips that the university shared. 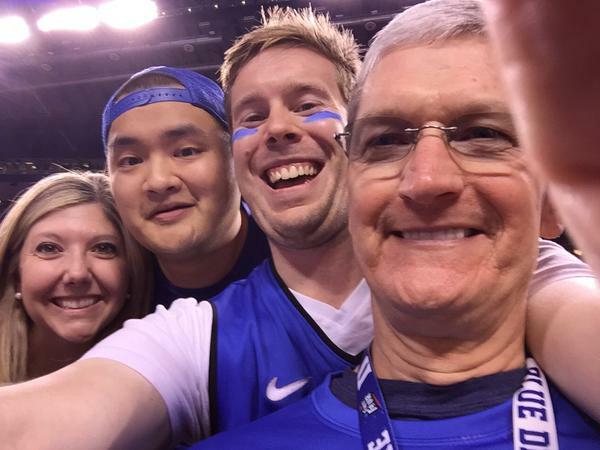 Cook has also long been a supporter of Duke University basketball and took several photos with fans during the school's NCAA Final Four men's basketball championship winning game against Wisconsin on April 6. The chief executive made headlines at the time for wearing an Apple Watch, which became available for pre-order four days later before officially going on sale April 24. I won't listen to Tim Cook discuss ethical leadership, as his idea of ethical is not paying musicians for three months. Someone please sack the man. I had a little bet with myself about what Apple hate the first comment would bring. I'm pretty pleased to note that your comment was both completely unrelated to the article, and completely incorrect (as Apple did mention they are paying musicians during the free trial). Indeed! The ability of some MacRumors commenters to manufacture faux outrage on command is truly amazing. It's as if Apple is holding them hostage and this is the only way they can express their disdain. I thought the Music Labels paid the Musicians? Silly me! The other new trustees are The Coca-Cola Foundation chairwoman Lisa Borders, PRM Advisors founder Patricia Morton, NBA commissioner Adam Silver and ValueAct Capital CEO Jeff Ubben. Welcome to Duke University! Please pick up your free, mandatory t-shirt! Really so the role of the CEO is to make sure the trains run on time? Do you think that's all Satya Nadella is doing at Microsoft, or Larry Page at Google? Well, if you want to simplify it ... yes, mainly. Of course they do lots of other stuff, as does TC. But the implication I got from your post is that you were comparing TC's role to Jobs', and I thought we've evolved beyond that here. Let's just get a little perspective. In 2011 when TC took over, we had MacBook Pros that cost ~£1500, with 4GB RAM and a standard HDD, OS X Lion, which crippled older machines and ran horribly on newer systems, a massive backlash from the wait for the new iPhone 4S, and an even bigger backlash at its lackluster update (compared to the wealth of exciting rumours, of course), genuine concern over Apple's future, location tracking controversy, more stuff about Flash not being on iOS devices, and Android gaining significant traction. Now we've got ultra-thin MacBook Pros with significantly more power, SSDs with read/write speeds that exceed that of 2xSATA SSDs in RAID, a much better OS and an even better update on the horizon, a company with a clear direction, and generally cheaper and more affordable products. Yeah there's a lot of bad stuff as well, but Apple is worth more than twice as much now. It's an unprecedented jump in fortunes, and Tim Cook has managed it exceptionally well. He's also more open with Apple's pipeline and stance on controversial issues. This was a very big criticism of the Apple of old. It's not perfect by any means; there's a lot I wish was changed and a lot Apple could do with their capital to make the bottom-line products worth buying. But boy am I glad we're in the Apple of 2015. If you could see the products now from 2011, I really don't think you'd make a similar comment. It's only because we've been slowly riding/watching the product curve that its true impact hasn't really hit. Seriously guys. Grow up! If you don't like Tim Cook then why are you wasting your time making these hate comments. You really have to wonder at some point if he's spreading his energy around too much. Isn't he on the board of Nike too? Not to make Steve comparisons, but it seemed like Steve was always laser focused on Apple. Tim seems to be using Apple to build himself. This has been addressed following Taylor Swift's complaint. They will be paid. He manned up and did the right thing. I bet a $10 million endowment for a School of LGBT Studies is imminent. who want to attend college with out the hassle of getting an actual education. What brainchild's were Cook's and have stumbled? If you're referring to Watch isn't it a bit early to call it a stumble. iPod didn't become a runaway hit until iTunes Store and especially iTunes on Windows (which Jobs originally opposed). And one could argue that iPhone didn't really take off until iPhone 4 when it came to Verizon. Maps. The very limited availability of the Retina iMac when released which put a hole in that years Q1 earnings. The very public John Browett debacle and the mishandling of Bob Mansfield's "retirement," then "unretirement." And finally, yes, the watch. A stumble is a stumble not a face plant fall. It means something didn't go as smooth as it should have. Do you honestly believe the AW launch was smooth with the awkward way customers had to preview it? Couldn't buy it in the store for months. Couldn't be delivered to online customers who bought 2 minutes after the online store opened for weeks after launch. Look at the front page regarding AW sales and tell me that isn't what you honestly think is a stumble. On the whole Cook hasn't had any clear major victories. That is my point. If he has please let me know. Happy to be corrected.